Before Elvis, before Elton John, Madonna and Lady Gaga, there was Liberace - infamous pianist, outrageous entertainer and flamboyant star of stage and television. A name synonymous with showmanship and extravagance, he lit up every stage he performed on, as bright as his candelabras and with a unique flair that gained him millions of devoted fans across the globe. In the summer of 1977, handsome young stranger Scott Thorson walked into Liberace's dressing room and, despite their age difference and seemingly different worlds, the two embarked on a secretive five-year love affair. To the outside world Scott was an employee, at most a friend, but behind closed doors his life with Liberace was an intense rollercoaster of hedonistic fun, flamboyance and excess. 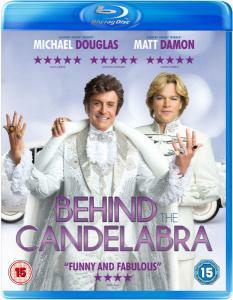 Starring Michael Douglas as Liberace and Matt Damon as Scott Thorson, Behind The Candelabra tells the fascinating true story of their glamorous life together and their tempestuous relationship - from the glitz and glamour of the early days in Las Vegas to their very bitter and public break-up.